Poulton Town’s Under-13s beat Kirkham Juniors Reds and ended their unbeaten run in the Blackpool and District Youth Football League. Poulton came out and really took the game to Kirkham hunting down every ball and it paid off with some well worked goals from Thomas Powl, Alec Davies-Ward and Regan Malone to give them a 3-0 lead at half-time. Kirkham came out in the second half and looked a different team, getting two goals back courtesy of Liam Geraghty and Tom Watmough and setting up a nailbiting last few minutes of the game. Poulton defended well and threw bodies at everything to preserve their 3-2 lead. The win keeps Poulton in third place but allowed Blackpool Rangers Tangerines to take top spot after their win at Warton Typhoons. Zico Allen scored four and Joshua Parkinson was also on target in their 5-1 win. St Annes Diamond and Wyre Juniors played at Blackpool Road North, where a very competitive game ended with St Anne’s winning 4-2. Wyre’s goals came from great strikes by Connor Ashton and Dylan Copeland. The Under-14s saw a very close encounter between Lytham Juniors Blues and FC Rangers at Park View, where Lytham managed to take the spoils with a 2-1 win (see pages 24-25). Therewas a bit of a scare when divisional leaders Squires Gate took on their club mates Squires Gate Reds. Although Squires Gate took the early lead with two quick goals the Reds side soon got a goal back from a great strike by Charlie Strachan. There were attempts at both end before Squires Gate managed to get two quick goals for a 4-1 half-time lead. The second half saw some resilient defending by the Reds, who never gave up on any ball and were unfortunate not to score again. No goals meant that Squires Gate won 4-1 with their goals coming from Dan Fryer (3) and Imaan Hussain. Poulton FC showed their improved form by beating Kirkham Juniors Blues 9-2 with their goals coming from Aaron Pope (2), Jake Merrick (2), Nico Cobb, Conna Smith, Reece Horan, Sol Mattatia and Ben Maude. 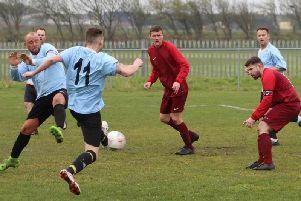 There was another exciting contest between Thornton Cleveleys Whites and Squires Gate Titans which ended with a 1-1 draw, Joseph Smalley scoring Thornton’s goal. In the Under-18s division, AFC Blackpool took on Clifton Rangers at the Mechanics ground where Rangers came out 4-1 winners with goals from Finley Clarkson, Alfie Tomlinson, Jamie Hargreaves and Theo Ioannou; Kieran Whitehouse scored for AFC Blackpool. Blackpool Rangers played Kirkham Juniors, who produced some good football to win 4-0 through Will Carter, Ben Rawcliffe, Joshua Marshall and Matthew Parker. In the other match Staining Juniors proved too strong for FC Rangers, winning 8-0. Blackpool FC Girls’ Under-16s progressed to the Lancashire Cup Final to face Formby FC with a fantastic 9-1 victory at Wigan. Two quickfire goals from Isla Makepeace gave Blackpool the lead, before an Olivia Golden penalty made it 3-0 after Makepeace was fouled by the Wigan keeper. Hannah Bettison then struck a powerful effort into the top corner before player of the match Makepeace completed her hat-trick and Wigan pulled one back. Molly Kelly scored a hat trick before Natasha Webster completed the scoring for Blackpool. Blackpool FC Under-13s are through to the last four of the Lancashire FA Girls Cup after a 6-0 win against Bury Girls. Their excellent passing and movement played a key part in the victory, with Anya Menzies scoring a brace. Coach Mike Healey described the game as Blackpool’s best performance of the season. YMCA Under-12s ran out 4-3 winners against Clifton Rangers at Seafield Road last Saturday in the nine-a-side division. YMCA started well, and a good spell of possession saw them take the lead. Reece Henderson fired in a shot which was parried by the keeper, with Hazem Abuzgia the man to tap in the rebound. YMCA continued to create opportunities, Ali Ruman finishing one in style to extend their advantage. They were unable to convert their other chances, however, and they were made to regret those later on as Clifton pulled a goal back. YMCA restored their two goal advantage, Abuzgia heading home from a Ruman corner, but a breakaway goal from Clifton meant the visitors went into half time with the momentum. YMCA continued their fast flowing approach and added a fourth through Henderson. Despite Clifton scoring again late on, YMCA held on to start 2018 with three points. The YMCA Under-13s suffered defeat for the first time this season, losing 3-1 to Squires Gate on a day they could only field 10 players with several hit by illness. Gate made the man advantage count and took a 1-0 lead going into half-time, after which two goals extended their lead further. Thomas Shuttleworth scored a consolation goal for YMCA. YMCA Under-15s beat Clifton Rangers Hornets 2-1 in a very entertaining contest. Clifton took the lead but YMCA created chances as Nathan Crook levelled by firing into the top corner. They scored the winner late on, when Jacob Grice’s shot was saved but Dimitri Jackson followed up to score from 20 yards. A spirited YMCA Under-11 Girls lost 6-0 to Feniscowles and Pleasington.